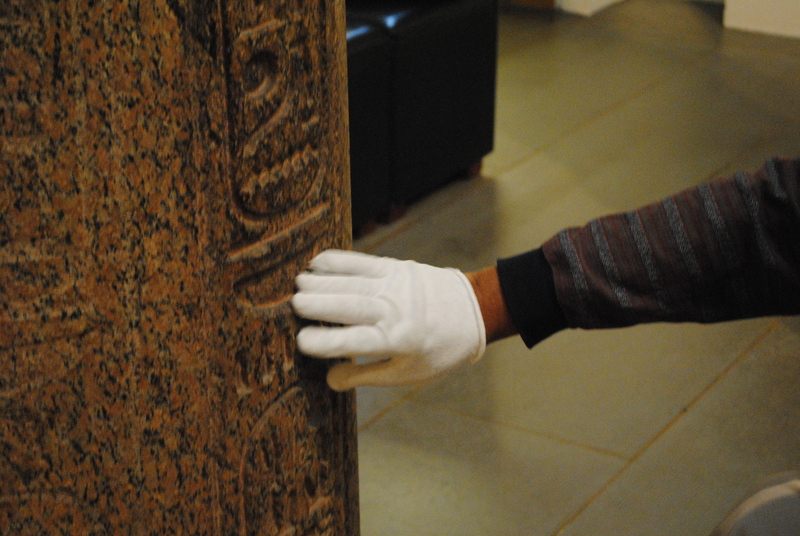 Wearing a white glove, Charles Tatum touches some of the artwork at the MFA’s Feeling for Form Access Program. Contrary to popular belief, it is actually easy for the blind and visually impaired community to enjoy a tour at the Museum of Fine Arts. A Feeling for Form is a program that offers a tactile exploration of select sculpture and furniture to visitors who are blind or visually impaired. For works that cannot be handled, there are verbal descriptions, tactile diagrams, and replica objects to help bring the art to life. The tours are which are led by trained museum volunteers or staff. 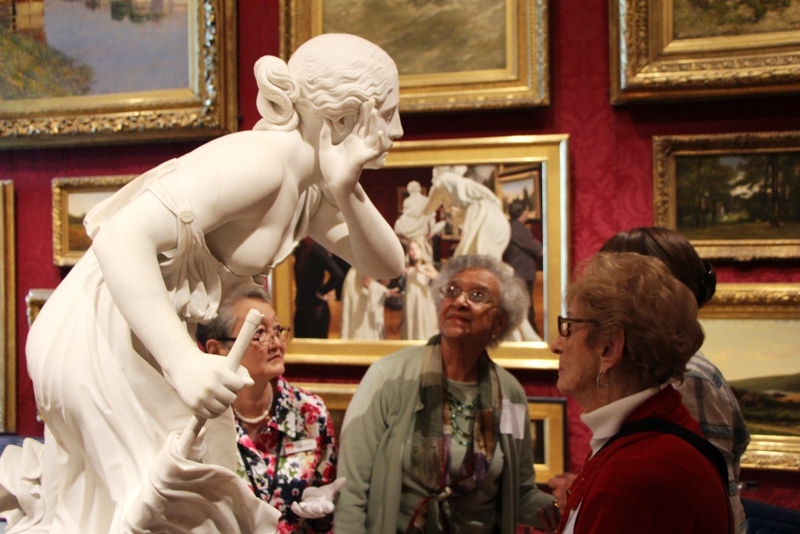 These tours are available for a variety of events, including the Inspiration of Helen Keller tours and the Art in Bloom 2014 celebration on April 25. 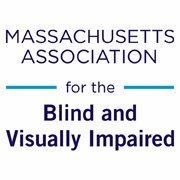 The Massachusetts Association for the Blind and Visually Impaired partners with the MFA to schedule several tours a year for low vision support group members. When Duford went a few years ago, it was the first time she had ever been to the MFA. She has returned multiple times since then. Members of the Sharon-Stouton Low Vision Support Group attend a Feeling for Form tour at the Museum of Fine Arts. One support group member (left) is wearing gloves to touch select sculptures. Another benefit of the tour is its pace, Duford says. She recalls that participants didn’t feel rushed and felt welcomed by the volunteers. “They do it at a pace where an older person could probably keep up with them, they seem very patient with people,” Duford says. Ruth Adjorlolo, former coordinator of the Sharon/Stoughton Support Group, has also attended several Feeling for Form tours. As a painter, Adjorlolo says she appreciates people getting to connect with art in new ways. A Feeling for Form tours are open to any visually impaired person. They can be scheduled on an individual basis or try out the info series, available the first Sunday of most months at 10:30 am. There is no fee for Admission or for the tour but pre-registration is required through the Access Department at the MFA. There are also other audio and tactile materials available for low vision visitors. Contact Valarie Burrows at 617-369-3302 or Hannah Goodwin at 617-369-3189 for more information. You can also send an email to access@mfa.org. The MFA offers more events and accommodations throughout the spring. See the details below. This tour revisits Helen Keller’s experience from when she visited the MFA and includes a touch tour of the collection of Art of the Ancient world wit ha focus on Roman art. Tours can be requested whenever the museum is open, but registration is required. Please schedule the tour 10 days in advance. For more information or to register, email vburrows@mfa.org. Guided tours are available for the annual celebration of art and flowers for Friday, April 25. Pre-registration is required and attendance is limited. For more information or to register email vburrows@mfa.org. For any visit, the MFA has an MFA Guide portable touch screen player, tactile and Braille materials and a large print map. Each of those items are available at the Sharf Visitor Center. If you’re interested in hearing about news and additional upcoming events from the MFA, email access@mfa.org and join our distribution list. March marks Women’s History Month, a celebration of remarkable females who have exceeded expectations, overcome prejudice and personal tribulations to make a difference in our world. Everyone knows about Helen Keller, the accomplished political activist and author who was deaf and blind. But many other blind and visually impaired women have made their mark in sports, arts, activism and other fields. MABVI shares with you some of the most accomplished women within the community. 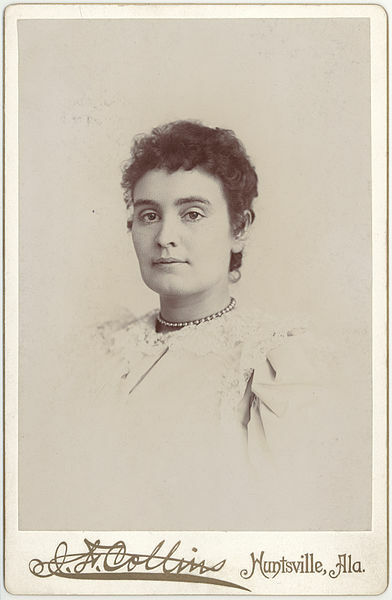 Formal portrait of Anne Sullivan taken around the time she first journeyed to Tuscumbia, Alabama to teach Helen Keller. Photo Courtesy of Perkins Archives. Anne Sullivan was a skilled visually impaired American educator, best known as Helen Keller’s mentor and best friend. Sullivan, who came from a poor family with little education, attended Perkins School for the Blind and graduated as valedictorian of her class, according to the American Foundation for the Blind. She spent the rest of her life as an educator in the manual alphabet and reading, teaching Keller’s lectures and ultimately lecturing with her. In 1915, she received a “Teacher’s Medal” at the Panama-Pacific International Exposition in San Francisco. Sabriye Tenberken, a co-founder of Braille Without Borders, appears at the campus of kanthari international. 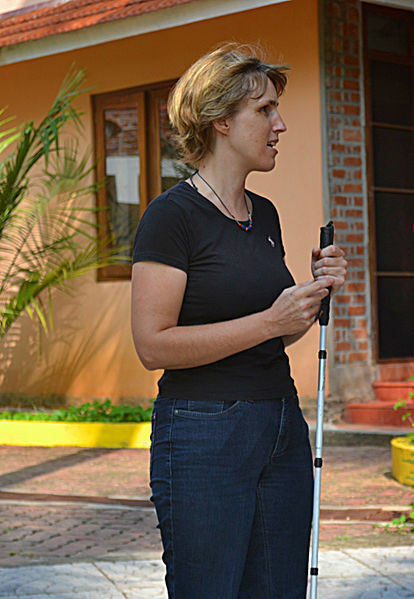 She is wearing a short-sleeved black shirt and has a white cane. Photo Courtesy of Wiki Commons. Sabriye Tenberken, of Germany, co-founded Braille Without Borders. The project was influenced by her work at Bonn University, as the first blind student to enroll in Central Asian Sciences, according to the organization’s website. She developed the Tibetan Braille Script to better understand the materials. Tenberken is now the co-director of the organization and focuses on fundraising, communication, curricula development and training the teachers. Susan Townsend is a prolific novelist and playwright, though she is best known for her character Adrian Mole. Her most recent book, published in 2012, is The Woman Who Went To Bed For A Year. Townsend has continued her Adrian Mole series despite going blind from diabetic neuropathy, according to the Independent. 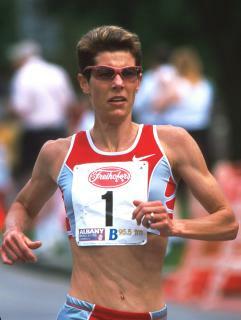 Marla Runyan, who became legally blind after developing Stargardt’s Disease, is a record-breaking Olympic runner. She started competing athletically while attending San Diego State University, becoming the first legally blind person and Paralympian to compete in the Olympic Games in Sydney Australia, according to the National Women’s History Museum. She finished eighth in the 1,500 meter, the highest record by an American woman for that event. Runyan holds other records and serves as the first Ambassador for Perkins. Terri Gibbs, of Augusta, Ga., has made a name for herself as a country/pop/Gospel singer. After touring with country music legend George Jones, she signed with MCA records and released her hit album “Somebody’s Knockin’,” according to her website. Gibbs won the first Horizon Award from the Country Music Award for new artist of the year, and she has also received the New Female Vocalist of the year from the Academy of Country Music and two Grammy nominations.